are built in the US by RMD. 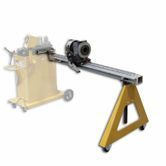 Baileigh Rotary Draw Tubing Benders can handle solid, round, square and pipe sized materials. The TN-800 tubing notcher is a unique Eccentric cut design, great for multiple size coping, angles, and offsets. Click pictures for details. WE CARRY THE FULL LINE OF BAILEIGH IF YOU DO NOT SEE SOMETHING GIVE US A CALL AT 775-746-2433 FOR MORE INFO.